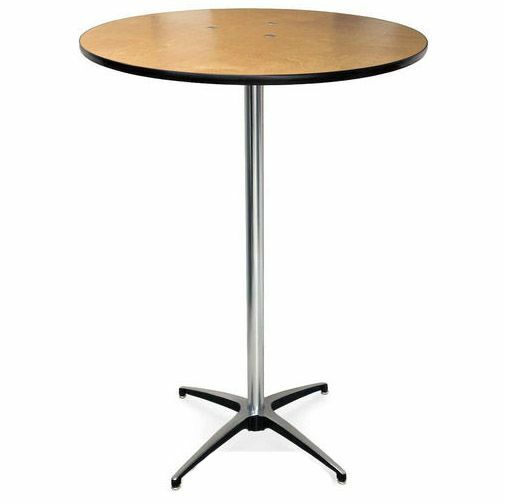 The ProRent Plywood Pedestal Table is quick and convenient, requiring no tools for assembly of the knock-down tables. The surface is easy to clean with a Plycoat finish, so you won't have to spend all night cleaning them! Leg caps keep the Pedestal Table from scratching vulnerable floors as well! The Plywood Pedestal Table is great for hospitality venues, celebrations, hotel dining spaces, bars, and more! Standard McCourt Manufacturing table surface is 3/4” minimum 11-ply plywood with PolyCoat finish on both sides for panel balance and vinyl T-mold edging. Sizes available are 24”, 30” and 36” dia. Cap is mounted to tabletop at our factory with three 1 1/4” elevator bolts and nylon nuts. Cap is unpainted cast aluminum and mounts to the underside of any tabletop up to 36” diameter. The standard cap has six 1/4” clearance holes on 7 1/2” bolt circle, is 8 3/16” in diameter by 2 3/8” tall and weighs 1.2 lbs. Center hole in cap accepts standard tapered column. The standard base is a 4 prong style, cast aluminum leg base. The underside is painted satin black with a polished aluminum top surface. Metal glides insert into casting pockets with permanent steel clips. The 24” base is standard for 24” & 30” diameter table tops, 3 5/8” tall and 2.35 lbs. The 28” base is standard for 36” diameter table tops, 3 5/8” tall and 3 lbs. Center hole in base accepts standard tapered column. Columns are heavy 16 gauge welded steel tubing with a 1 3/4” outside diameter. Tubing is nickel-chrome plated after having standard tapers (1 3/4” x 1 5/8” x 2”) swaged onto both ends. Columns are sized to give standard heights of 30” and 42” with 3/4” table top thickness. The 42” column is 39 1/8” long and 3.7 lbs. The 30” column is 27 1/8” long and 2.6 lbs. Optional black column available. Telescopic Column gives table heights of 30”, 36” and 42” from a single adjustable column. Heavy 16 gauge welded steel tubing telescopes using 1 7/8” dia. over 1 3/4” dia. nickel-chrome plated tubing with standard tapered ends. Height adjustment is onehanded button operation, secures with locking bolt. Indexed tubes maintain hole to button alignment. Total weight 4 lbs. Aluminum SuperEdge - smooth wrap around T style edging for greater edge protection. Laminate surface available in 6 stock patterns. Cap-mounted to laminate tops using three 5/8” bolts and blind nut inserts.